Mon, Jun 22, 2015, 5pm to 6pm, CWG Full Group Meeting, Two Bridges Senior Apartments, 80 Rutgers Slip - Frank T. Modica Room. Agenda: Election of co-chairs; Discussion of Implementation Action Team. May 18, 2015, 5pm to 6pm, CWG Full Group Meeting, Two Bridges Senior Apartments, 80 Rutgers Slip - Frank T. Modica Room. Tuesday, April 15, 2014, CWG Coordinating Committee, 4PM to 5PM, Community Board 1, 49-51 Chambers Street, 7th Floor, Manhattan. March 19, 2013 - CWG Coordinating Committee Meeting, 4pm to 5:30pm at CB1, 49-51 Chambers Street, 7th Floor. Feb 19, 2013 - 4:00PM Coordinating Committee Meeting, Community Board 1, 49-51 Chambers Street, 7th Floor, Manhattan. Dec 3, 2012 - Full Group Meeting, 5:30pm, American Legion Post 1291, 191-193 Canal Street, 2nd Floor -Minutes, Proposal Letter to New Museum. July 17, 2012 - CWG Coordinating Committee Meeting, 4PM to 5:30PM, Community Board 1, 49-51 Chambers Street, 7th Floor, Manhattan - Minutes (reviewed for approved at Sept 9 th meeting. June 18, 2012 - CWG Coordinating Committee Meeting, 4PM to 5:30PM, Community Board 1, 49-51 Chambers Street, 7th Floor, Manhattan. April 17, 2012 - CWG Coordinating Committee Meeting, 4 -5:30 PM, CB1, 49-51 Chambers Street, 7th Floor, Manhattan. DATE CHANGE: March 19, 2012 - CWG Coordinating Committee 4PM, CB1, 49-51 Chambers Street, 7th Floor, Manhattan. February 21, 2012 - CWG Coordinating Committee, 4PM, CB1, 49-51 Chambers Street, 7th Floor, Manhattan. January 9, 2012 - Full CWG Meeting, 5:30 pm American Legion Post 1291, 191-193 Canal St. 2nd Fl. Full CWG Meeting, Monday, November 7, 2011, 5:30 pm American Legion Post 1291, 191-193 Canal St. 2nd Fl. Full Group Meeting - Monday, July 11, 2011, 4:00 pm, American Legion Post 1291, 191-193 Canal St. 2nd Fl. a) voted for new Co-Chairs, one to represent the downtown Community Boards 1, 2, or 3, and the other to represent a community-based organization. Members elected Antony Wong (representing Community Board 2) and Mae Lee (representing Chinese Progressive Association as Co-Chairs. CWG would like to thank Gigi Li for her service during the past nine months as Acting Co-Chair. We look forward to her continued guidance as we start to complete work to create a 197-a Plan for Chinatown and its surrounding areas. b) approved the Transportation Preliminary Action Plan with two amendments. Amendment #1 - eliminate paragraph about relocating One Police Plaza. Amendment #2 - add a paragraph for the NYC Dept. of Transportation to acknowledge the increase in pedestrian and vehicular traffic in Chinatown and Little Italy, and to address these changes. c) approved the creation of an Implementation Task Force to engage NYC agencies, elected officials, and other relevant parties, in the advancement of the endorsed preliminary action plans. 2) In addition, there was a report from the Culture, Preservation, Affordability, Zoning (CAPZ) committee Co-Chair Victor Papa. The next CAPZ meeting will be held on Tuesday, July 19, beginning 12PM, at Community Board #1, 47-51 Chambers Street, 7th Floor, Conference Room. At this meeting, the work team will a) continue discussion on a proposed RFP for a consultant to work on zoning, affordability and preservation, and b) continue discussion of the CAPZ workplan. All are invited and encouraged to attend. 3) There will be no full group meeting in August 2011. Full group meeting times - passed, monthly full group meeting times held on Monday, alternate between 4:00-6:00pm, and 5:30-7:30pm. Full CWG meeting April 4, 2011 at 4pm at American Legion Post 1291, 191-193 Canal St. 2nd Fl. Agenda: Draft minutes and all documents regarding voting are at the links below. Monday, January 30, 2011 at 6pm, Governance Committee, Immigrant Social Services, 137 Henry St.
Monday, January 10, 2011 – 6 PM, CWG Full Meeting - American Legion Post 1291, 191-193 Canal Street, Floor 2.
from the links provided above. Monday, November 1st, 2010 6-8pm, Full CWG Meeting, American Legion Post 1291, 191-193 Canal Street, Floor 2. Wednesday, October 27, 2010, 6-7:30 pm, Governance Committee Meeting, 49-51 Chambers St. Room 501. Brief Meeting Summary (Contributed by Bethany Li, AALDEF). -Doug: How would that work? E.g. would one group get 3 votes and the Pistol Club would get one vote? Also has Pistol Club ever come after first mtg.? -Jan: How does Pistol Club get the same vote as CCBA? Also constantly saying we have 52 voting members is disingenuous. -Victor: This is a time to ask groups to reaffirm commitment to CWG. Danny, Ed, Rob, Jan will work on proportional representation structure and bring back to our next governance meeting. Agreement among group that there should be a steering committee with chairs that head various committees. Thursday, October 21, 2010 Executive Committee Meeting, from 4-5:30pm, the Community Board 1 office, located at 49-51 Chambers St. Room 715. First, the members present voted to consider “finalizing” the preliminary action plans of three committees: Education and Schools, Immigrant Affairs and Social Services, and Parks, Open Space, and Recreation. A vote to finalize the plan would mean that CWG members could start meeting with representatives of various City agencies to discuss the feasibility of the requests cited within each Preliminary Action Plan. Second, the members of the CWG voted to establish a subcommittee on governance to discuss potential changes to CWG’s leadership structure, distribution of workload, and voting process. Lastly, the CWG voted on a temporary leadership structure of acting co-chairs with a term of 3 months. In accordance with the previous elections, one co-chair would be a representative from the downtown Community Boards 1, 2, or 3, and the other co-chair would represent a community based organization. Members elected Gigi Li (representing Community Board 3) and Mae Lee (representing Chinese Progressive Association) as CWG’s acting co-chairs. Former CWG co-chairs Jim Solomon and Thomas Yu served for 18 months and led the group from an ad hoc coalition of a few community stakeholders to become a powerful voice for community planning in Chinatown and neighboring communities. Both decided not to accept nominations. While a change in leadership represents a time of transition for CWG, we urge all community members and stakeholders to continue working together to move the agenda of CWG forward. 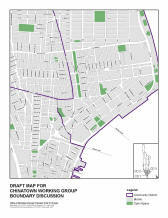 Our next steering committee meeting is scheduled for Thursday, October 21st from 4-5:30pm, the Community Board 1 office, located at 49-51 Chambers St. Room 715. An agenda will be sent out prior to the meeting. All are welcome to attend and participate. As the newly elected co-chairs of CWG, we are excited to carry on the mission of CWG and build upon the work it has done. We look forward to working with everyone in the community. August 26, 2:30 pm. Special Steering Committee Meeting, CB1, 49-51 Chambers Street, Room 709. Of special note, three CWG Working Teams (listed above) will be presenting their "final" proposed Preliminary Action Plans & Study Areas for consideration by the full CWG. These recommendations are the result of a year-and-a-half of extensive community outreach via regularly held public Working Team meetings, two Town Halls attended by hundreds and conducted in multiple languages and feedback from Community Board Committees focused on similar topics. Just a reminder that no votes to endorse these proposals will take place at Monday's meeting. The Full CWG will wait until ALL of the Working Teams have submitted their "final" recommendations for consideration before voting. The CAPZ and Economics & Transportation Working Teams are still developing their recommendations and will present their "final" proposals at the September Full CWG meeting. Please note that due to scheduling conflicts the September Full CWG meeting will no longer take place on Monday, September 13. It has been rescheduled to Monday, September 20, 4-6pm @ American Legion. Also of note at Monday's meeting, at the request of the CWG Finance & Fundraising Committee, Mary McCormick, President of the Fund for the City of New York, will make a brief presentation regarding potential fiscal sponsorship of the CWG via its Incubator Program. In addition, at Monday's meeting the Full CWG will select its three CWG representatives to serve on a selection committee with reps from NYC EDC. Please note the CWG hopes to have a planning consultant on board by October, so this Monday's meeting is an important step in this process. 3pm to 4pm - Finance Committee - A second meeting will occur on Dec. 2 to follow-up questions regarding feasibility of nonprofit filing; potential sources of funds to support basic CWG needs and future expenses. UPDATE: Dec. 2 meeting was cancelled pending funding clarification from LMDC. 4pm to 6pm - Steering Committee discussed Preliminary Action Plans, format, streamlining format for Town Hall presentation, preparation for translations and posting of full plans for public review and comment. Additional time was spent on mapping agendas for the December and January meetings in preparation for the Feb. Town Hall. Monday, Nov. 2, 2009. Full CWG Meeting,4-6pm at the American Legion Post 1291, 2nd Floor, 191-193 Canal Street. Jim Solomon and Thomas Yu reported that in the last Steering Committee meeting, the body proposed a date of June 1st, 2009 for the first public Town Hall meeting in lieu of the regular monthly full group meeting. The purpose of the Town Hall is expand outreach and gain feedback from the general public to guide the Working Group’s planning. CWG Steering Committee. Wednesday, February 11, 2009, 4-5:30pm, Community Board #1, 49-51 Chambers St, Rm. 709, New York, NY. presented a general map of greater Chinatown illustrating some current land use characteristics.